Q'tron is intuitive, flexible, responsive, retina-ready, future-proof, customizable modern business WordPress theme. It's best suited for business websites, agencies, nonprofits, blogs, portfolios and other want-to-look-modern sites. The theme is really easy to use yet incredibly powerful. With Q'tron you will boost your online presence big time! To choose just a few among many of great features of this theme: fully GPL licensed, automatic header color setup, intro title parallax effect, full Beaver Builder page builder support for creating stunning page layouts with ease, clean, flexible, extensible and future-proof codebase, Theme Hook Alliance action hooks support, great customization options, Jetpack plugin integration, SEO friendly markup, timely dedicated support, and a lot more. With this theme you only get what you need. The theme contains no shortcodes, no sliders, no custom post types integrated. It is totally transferable and prepared for the future with no restrictions! 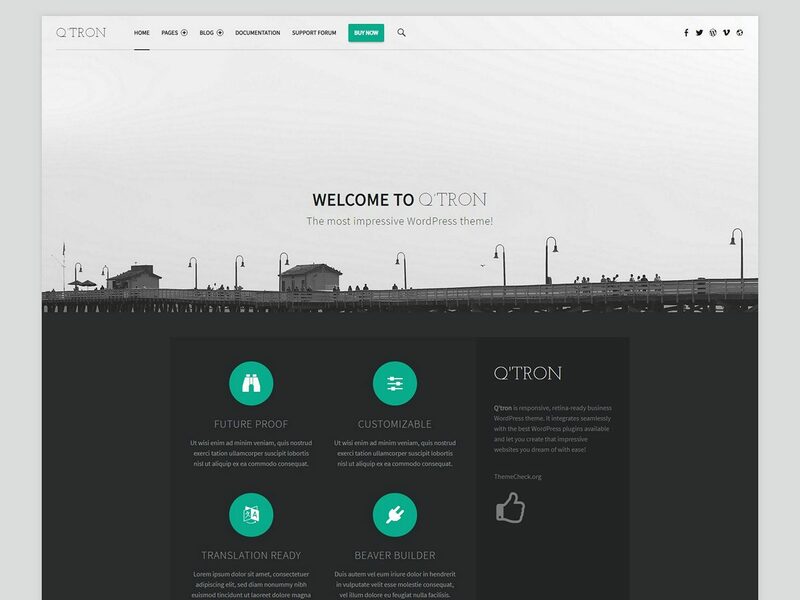 Q’tron theme uses functions build right into WordPress itself, so it is fast, reliable and stable. With theme customizer you can control the whole appearance of your website: from colors to layout.